PS. 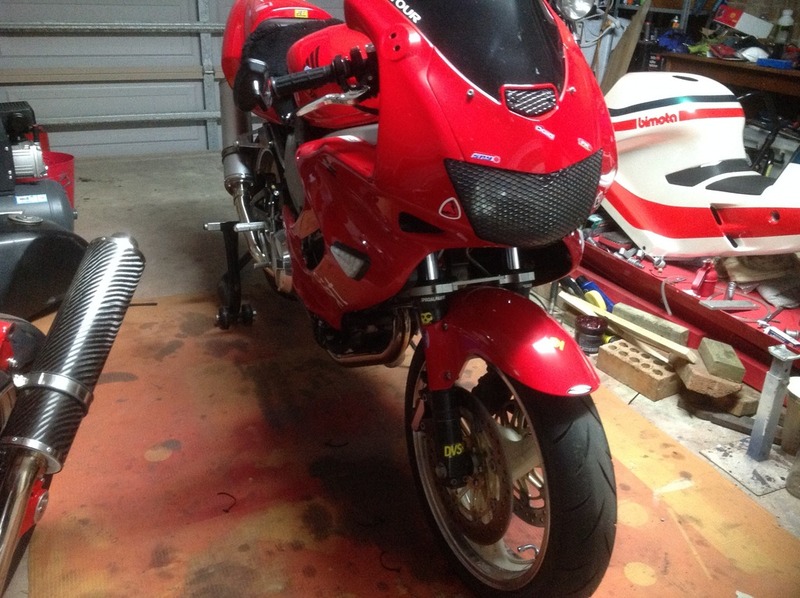 I am also still looking to buy some 2002+ VFR bars for my SH. Jamie Daugherty offers a replacement top yoke for the SH. Check DMr Motorsports. I don't think it's on the Web site. You'd have to contact him. Last edited by VTR1000F; 03-20-2017 at 05:25 PM. It's not so much of the stock triples flexing like a wet noodle as much as it is the stock forks. You just want some bling up there? No I don't care what it looks like as long as it's decent, I just thought it might help a bit with upgraded from stock forks. This is part of my question; is the triple clamp that important if I'm sticking with stock forks upgraded by Racetech? IMO the best thing for you to do in this instance is the worked oem forks, oem triples with a brace like the Coerce. If you are running the stock 41mm forks, you don't want 2002-onwards VFR bars as these all use 43mm forks. VFR's from about 1990 through to 2001 all used 41mm forks so the bars from these would fit your forks. Try a Coerce fork brace, it worked for me after fitting f4i calipers. Tightened up the whole front end . The Coerce gave a great result for minimal time and outlay and stopped the forks from flexing except under hard hard brakes . One of the mods that I have done that gave the bike a different feel immediately. I have now gone to a USD but could still live with the setup I had. Great info guys, thank you very much, for some reason I didn't realize the stock forks were 41 mm I thought they were 43. No wonder they're so flexible. if you still have that brace and want to sell it. I'd buy it off you for a reasonable price. I'd also buy some race tech springs .90 or . 88 approximately, if anybody has some that don't have a ton of miles on them. Last edited by thephatboi; 03-21-2017 at 09:52 AM. Sonic Springs were the best price when I recently did some comparison shopping. I have swapped my brace with another VTR owner for some parts they had that I wanted. Has anyone just modified (grinded/drilled), another VTR triple to use as a fork brace? It would take major machining to get a upper triple to fit on the lower fork legs, just not worth the time. Though the true weak spot in the stock front end was identified and then just dismissed. It is the lower triple clamp. One of the reasons the fork brace helps so much on a VTR. Then again I don't run a stock front end, so no worries either way for me. i managed to make a cb1300 fork brace fit mine and it stopped a bit of flexing at track days. for road use you would be hard pushed to tell the difference tho.